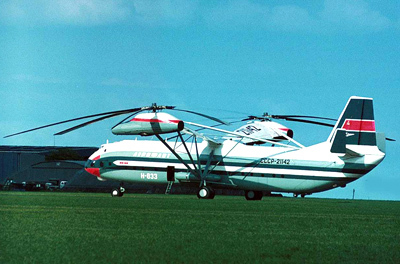 The MIL V-12 was a enormous twin-rotor helicopter developed by the USSR during the height of the cold war. The Mil V-12 went by the western reporting name 'Homer'. 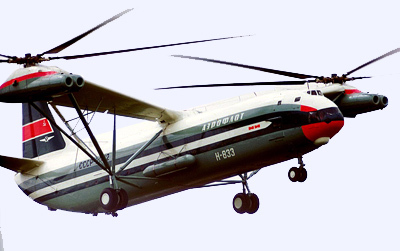 Measuring 37 meters (121 ft) in length, and with a rotors measuring 35 meters (114 ft) in diameter the MIL V-12 was the largest helicopter ever built. 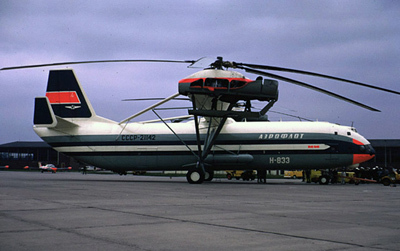 Unlike most twin-rotor transport helicopters - like the Chinook - which have their rotors at the ends of the fuselage, the Mil V-12 employed a side-by-side layout with the rotors housed at the end of long booms. The Mil V-12 made its first full flight in 1968, and by 1969 the aircraft had set no less than seven load-carrying records. Including one lift of 40,204 kgs (88,635 lbs) to a height of 2255 meters (7,400 ft). The Mil V-12 had a crew of six, and under normal circumstances could carry up to 120 passengers, or a load of 35,400 (77,162 lbs). The aircraft had a top speed of 161 mph (259 km/h). At maximum capacity the Homer had a range of 311 miles (500 km). In total three prototype examples of the Mil V-12 Homer were constructed. In the end however the Russian military opted for a more conventional heavy-lift transport helicopter in the form of the Mi-26 (reporting name 'Halo'). The Mi-26 was a single main-rotor helicopter which first flew in 1977, and also took the title of 'worlds largest production helicopter'.